Today I'll take a break from beer and review Laphroaig's latest expression -- an 18-year-old bottled at cask strength 48% ABV, 10% stronger than the Laphroaig 10 and 15 year old bottlings. [Update 2011/04/26: An astute reader pointed out that I mistakenly said it was cask strength. Yes, it's stronger than the 15, but not cask strength.] It has been on the market for at least six months now, but I spend so little time in liquor stores these days that I didn't notice it until a couple of weeks ago. Man, oh man, I'm glad I finally did. I have a new favorite Scotch whisky. Well, the legendary sherry-cask Talisker 20 might never be displaced, but let's say that of all the whiskies available to me today, this is tops. Laphroaig is a long-time favorite of mine. 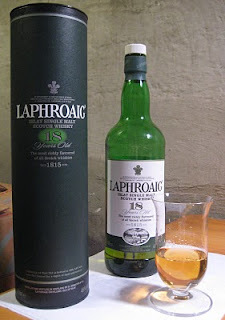 I love the intense smoke/seawater/medicine flavors of Laphroaig 10; I appreciate the mellower, more refined presentation of Laphroaig 15; I respect the big Islay wallop of the Laphroaig Quarter Cask. Take the strengths of those three variants and put them into one bottle, and voila, you have Laphroaig 18. In other words, if you're a fan of the distillery and you haven't had this yet, you must try it. The 15-year-old -- which by the way is being replaced by this 18 -- is a nice dram, but it always disappointed me a little bit because it gives up too much of the flavor you get with the 10-year-old. On the other hand, there's no denying that Laphroaig 10 is perhaps a little too pungent. The 18 is the best of both worlds. It rounds off the harsh edges that remain in the 10, without losing the massive assault of peat smoke and iodine that defines Laphroaig. The peaty, briny finish stays on the tongue for ages. It's a big 'un, too: 96 proof. Don't dilute this masterpiece very much, but to really open up the flavors, add 1 or 2 drops of water. The price is a steal for this caliber of whisky: right now it's $78 in Oregon liquor stores. That price may be headed up: Google turns up prices over $100, and a California liquor store favored by some Scotch-loving friends of mine is selling it for $130 (for comparison, they list Laphroaig 10 at $30, far cheaper than the usual Oregon price). Click here to order Laphroaig 18 from British retailer Master of Malt: it's a 70 cl European bottle, but remember to request your 16% VAT refund if you're ordering from outside the EU. That's a big investment up front, I'll grant you. However, since we're beer aficionados around here, let's try and convert it into a beer price. Now, the alcohol kick isn't the only thing we look for in a drink, but ABV makes a handy parameter for comparing beer and whisky, so let's use that. Furthermore, let's think of a cask-strength Scotch as akin to a burly, special-release 10% beer sold in a 22-ounce bottle. The 750 ml of 96 proof Scotch contains 12.17 ounces of alcohol; the 22 oz. of 20 proof beer contains 2.2 oz. of alcohol. So drinking the bottle of Scotch is like drinking 5.53 bottles of a big beer, as far as your Breathalyzer is concerned. Divide $78 by 5.53, and you get $14.09. A little on the high side, but for a really special beer, wouldn't you pay it occasionally? Especially if the bottle lasted you a few months? By the way, that's an SPE of $46.11 -- less than the SPE of Rogue's XS series, for example. Since we’re playing with the numbers in an effort to put the cost into beer pricing terms, I recommend looking at the per serving cost. Assuming a standard shot is the proper serving size for Scotch, and that a shot is 44.36 ml, then there are just shy of 17 servings in a 750 ml bottle. That comes out to $4.61 per serving, which is well within the “reasonable” range for a pint of beer. That's good! I like your number better than mine. Better rationale, too. This sounds fantastic. A bit pricey, but its not something you drink every day, so maybe it is worth the occasional splurge. You have made it very tempting. I ran across an article in the April edition of Esquire magazine. It dealt with beer cocktails. The last one suggested mixing Laphroaig with Budweiser. Seems a bad idea to me. Bill, give it a shot and report back please! Despite your rationalizations, $78 is still $78, and last I checked, I'm still unemployed. So maybe this isn't in my immediate future. But I'll put it in the back of my mind. @Jason: These men's-magazine drinking articles will be the death of us all. @Jeff: Yeah, Ardbeg 10 and Lagavulin 16 are wonderful Islays -- still big and smoky but a little more refined than Laphroaig 10. Don't get me wrong, I love things that are too pungent. But this 18 is a new classic. Any of you cheapskates out there like Bowmore? They've got a dozen different bottlings, some of which I like a lot and others of which are disappointing. Any recommendations?